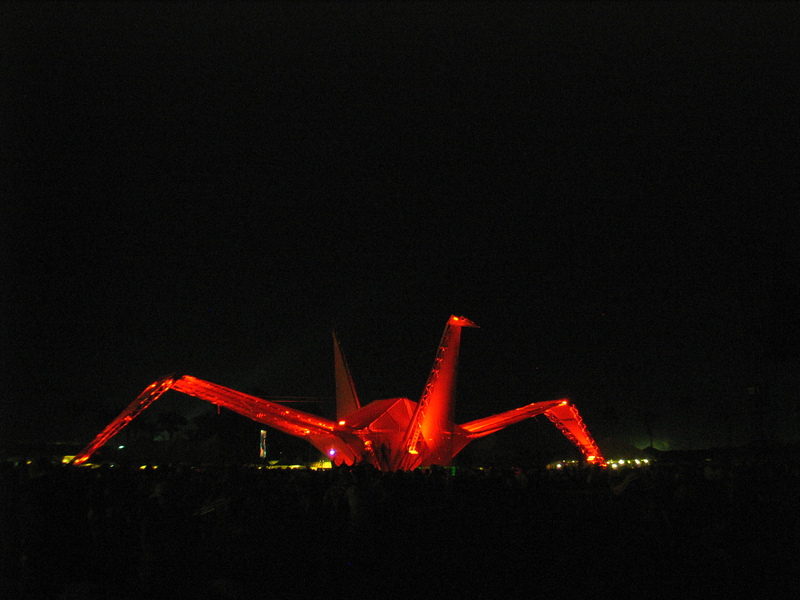 In 2010, Crimson Society was commissioned to create an installation for the Coachella music festival. 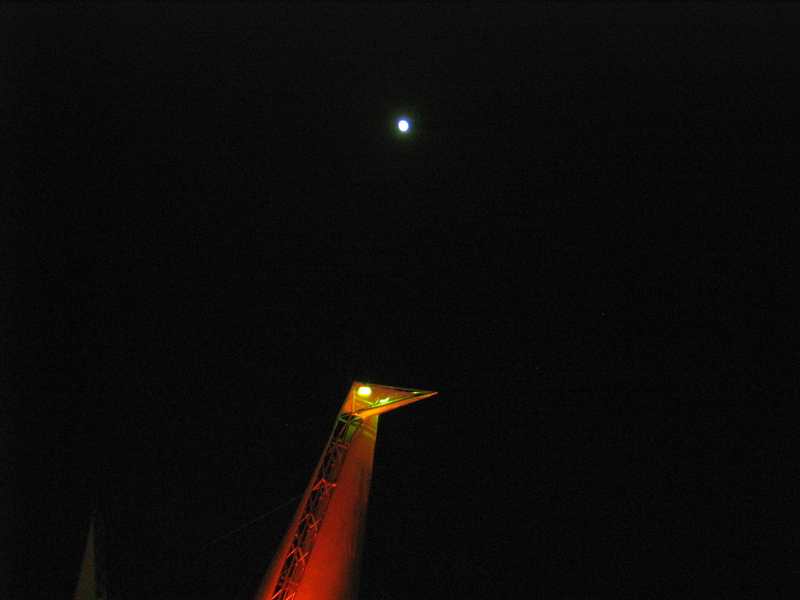 The event organizers had very few restrictions on the final outcome of the project other than it had to be large scale and affect the horizon. Having few restrictions, we chose to create not just an installation, but rather a symbol with a purpose. We also wanted it to live on past the event so we designed it to be “reusable” so that it can be assembled anywhere. 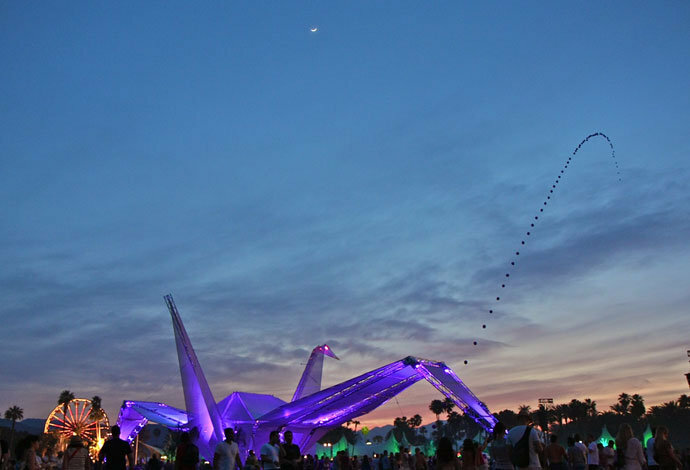 The result of our collective efforts is “Ascension” affectionately known as Coco, a 150’ origami crane (with roughly the same wing span of a boeing 747). In the Japanese culture the Crane is seen as a symbol of peace, luck, prosperity and health. It is believed that if you fold a thousand origami cranes, the universe will grant you a wish. 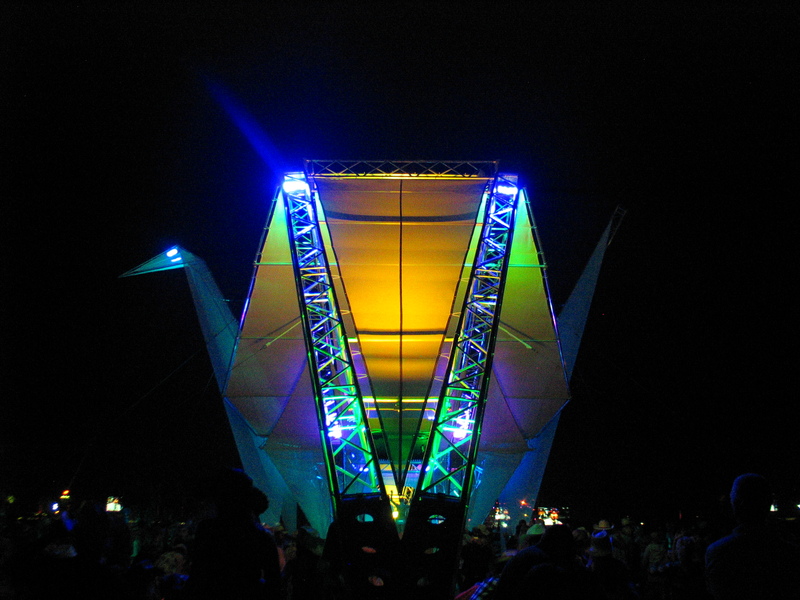 We chose to build a giant crane in the style and tradition of origami; so wherever it went it would bring with it the spirit and the energy of peace and wellness. 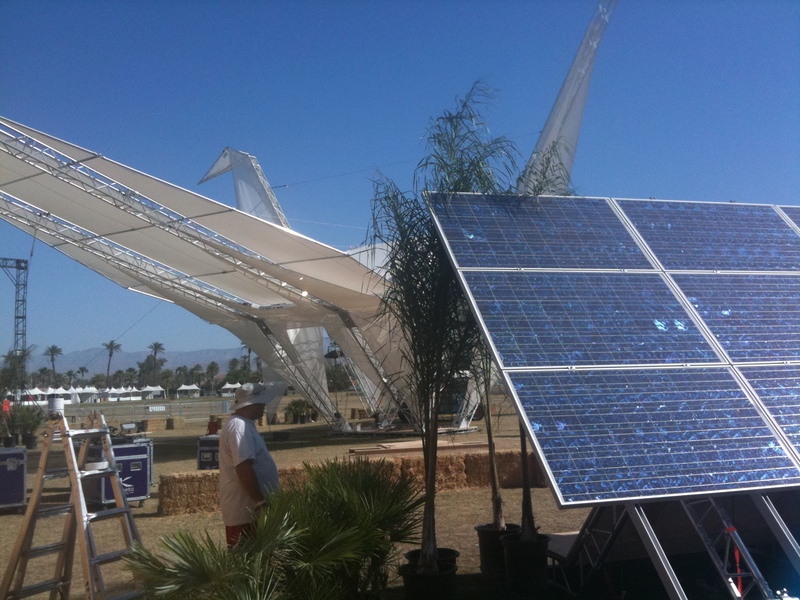 The Coachella Valley Music and Arts Festival (commonly known as Coachella, Coachellafest or Coachella Festival) is an annual three-day music and arts festival held at the Empire Polo Club in Indio, California, in the Inland Empire’s Coachella Valley. 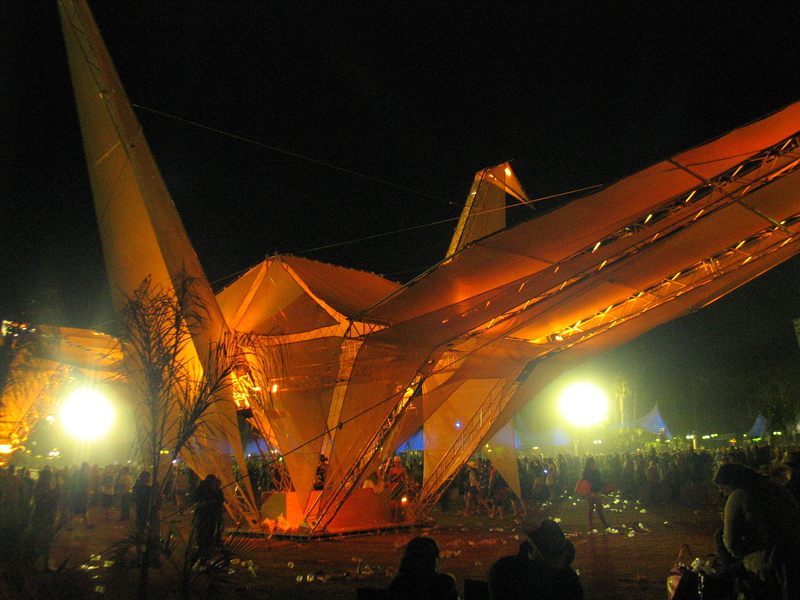 The event features many genres of music as well as large sculptural art. The Crimson Collective is a Los Angeles-based consortium of artists, architects, and designers who bridge the gap between art and architecture, creating experimental and temporary built environments that evoke action and intention through physical interaction. The Crimson Collective functions as the design muscle that helps fund and support the work of the Crimson Society, a non-profit comprised of thought leaders and visionaries from across the arts and sciences. the society serves as a crucible for exploring alternative ways of building economically viable, socially responsible, sustainable communities as a way of stemming the pervasive problem of chronic homelessness. The Crimson Collective sees design as an engine for positive social change. Rodrigo Gonzalez – production / assembly coord.